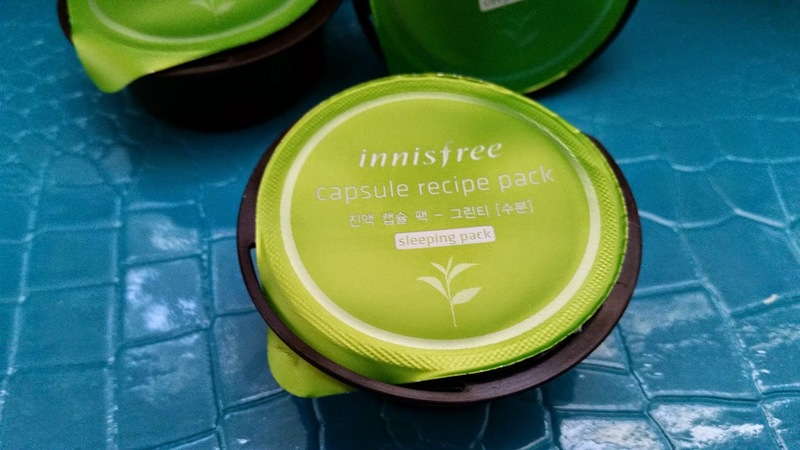 I have been in love with these Innisfree Capsule Recipe Green Tea Sleeping Packs since I got them in my second Innisfree haul. However, before we get to that, let me tell you a little story about Innisfree and I. The first Innisfree product I've ever tried was their Jeju Volcanic Pore Clay mask about 3 years ago. I quickly fell in love with it. It worked wonders on my combination to oily, acne prone, and sensitive skin; so I used it once a week, religiously. About 8 months after, the mask stopped working on my skin as well as it did before. 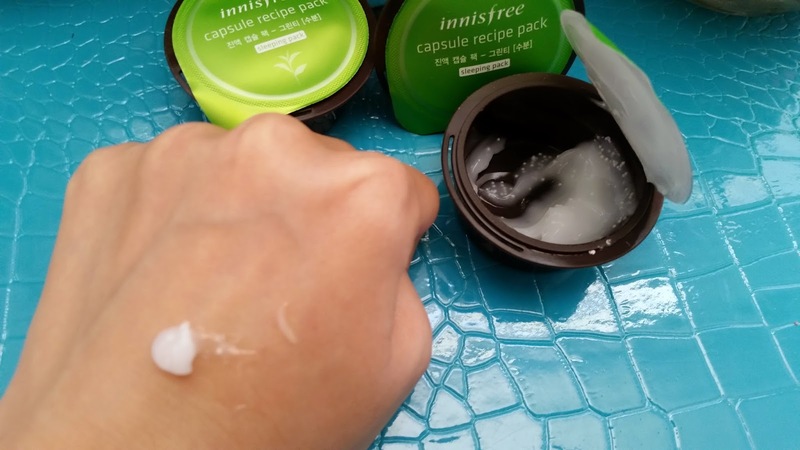 I thought it was my skin getting used to the product, so in my path to discover my holy grail skin care products, I shifted away from Innisfree. Then it happened. Last year, shortly after I started purchasing from Memebox I found out a South Korean brand was opening their Global Online shop. The familiar name prompted me to look for them on Facebook and there it was, Innisfree. It was like finding a long lost lover and I was so glad I came across it. With their Grand Opening deals, I purchased my first haul from their global shop. 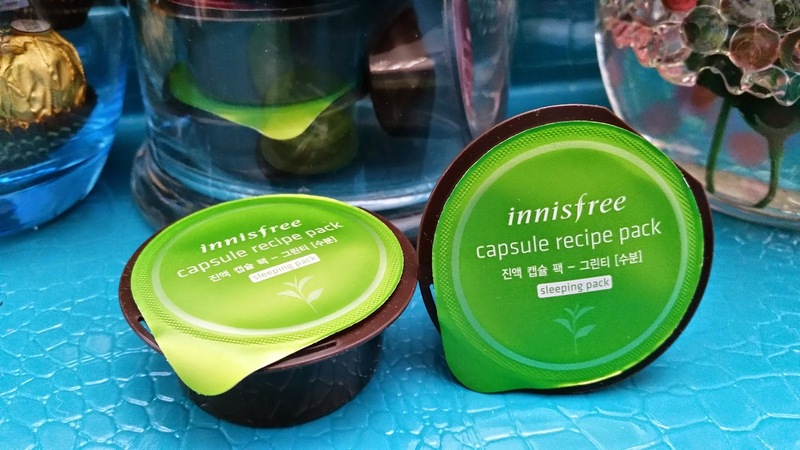 I saw a lot of intriguing Innisfree products that I knew I wanted to try and amongst those are their Capsule Recipe Packs. 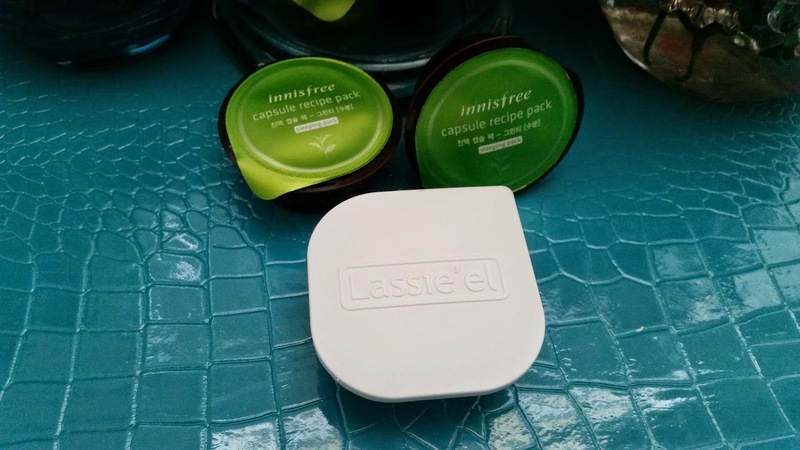 So, when Innisfree offered these capsules on sale last Cyber Monday, I knew I had to make another purchase. 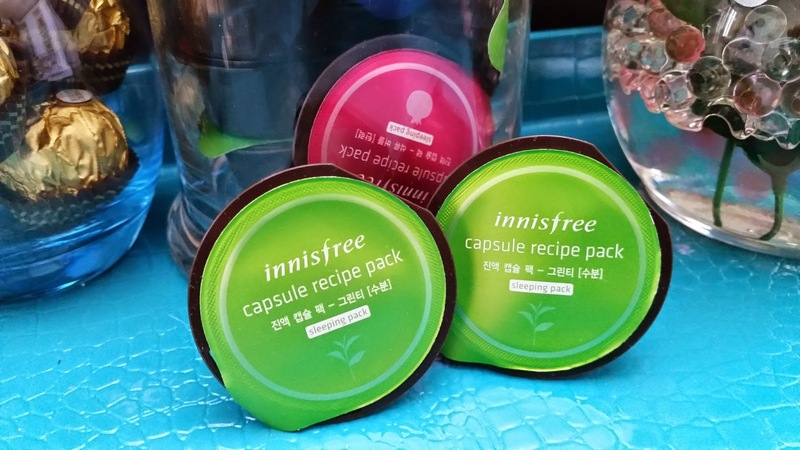 A variety of Innisfree Capsule Recipe Packs. 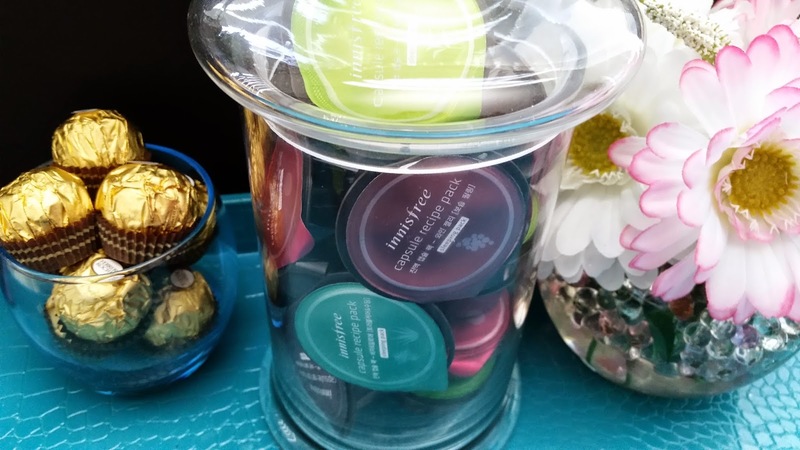 The Capsule Recipe packs looked like k-cups for coffee or tea, however, instead of putting it in your morning cup of happiness, it's happiness for your face. There are 5 sleeping pack choices, which are Wine, Green Tea, Rice, Bija + Aloe, and Pomegranate. There's also 1 scrub pack choice, the Seaweed and 1 clay pack choice, the Jeju Volcano. Aside from those there are also 7 different kinds of wash off capsule recipe packs. Plenty of choices and plenty to choose from. I was swamped to say the least. After some debate, I decided to try the sleeping packs and the scrub seaweed packs first. So, in my second Innisfree haul, I purchased a total of 24 Capsule Recipe Packs, 4 kinds of sleeping packs and the scrub packs. I have been using them for the past 3 months and I love them. One of my favorite ones is the Green Tea Sleeping Pack, So today, I will review them and share my thoughts on it. Product Description: A sleeping pack formulated with organic Jeju green tea to keep the skin moisturized and clear while sleeping. It can provide suppleness to the skin to keep its fair complexion. These packs uses Innisfree's "Dual Moisture-Rising Technology" to harvest organic green tea and green tea seed oil. Both of which are rich in amino acids and minerals to moisturize the skin. Plus the seed oil captures moisture inside the skin to keep it hydrated for a longer period of time. The organic green tea and seeds used are also anti-oxidants and rich in nutrients that can help brighten the skin tone. Here's what the Capsule Recipe Sleeping Pack looks like on the inside. As you can see, it's a milky-colored gel pack with tiny white beads inside. Before I use any product I like to do my 3 Step Patch Test. Since I have sensitive skin, these steps are very important to ensure I don't use a new product that could irritate my skin or cause break outs. 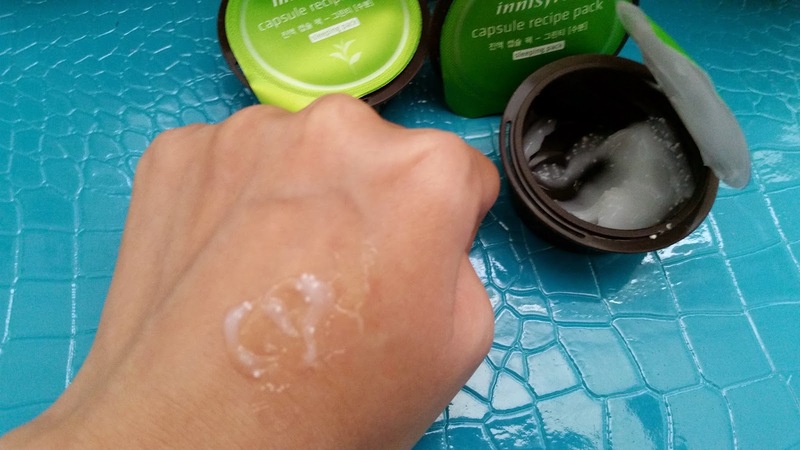 The first step of my 3 Step Patch Test is to test the product on my wrist. I usually do this for about 1 to 3 days before moving to step 2. Step 2 is patch testing the product on a spot on my face, again for 3 to 4 days. I usually test the product near my temples or the area close to my ears, so if I have any irritations or break outs due to the product, I can easily hid it with my hair. Step 3 is to test the product on my entire face or the area in which it is meant to be used on. If there's any irritation at any stage or if the product causes break outs, then I will stop using it immediately. This 3 Step Patch Test might not work for everyone, but it works for me and have been able to keep irritating products at bay. It's probably saved me from a lot of potential break outs and irritations. Aside from my 3 Step Patch Test, I also like to test out a product for a least 2 month before I blog about it. This gives me plenty of time to try out the product and decide my feelings on it. Sometime a product could have made a great first impression only to come up short in the long run. And some products that might not have set a great first impression could turn out to be an amazing product. Using a product for at least 2 months gives me plenty of time to test it out to its full abilities and discover all of the product's pros and cons. The Capsule Recipe Green Tea Sleeping Pack has a gel like texture with a milky color. It contains white micro beads, as you can see in the picture above. The texture is very smooth and not sticky at all. I found the formula absorbs quickly, so sometime I like to apply a second layer. Or if I'm feeling lazy that day, I'll just heap on a thick layer. Which ever the case the formula will be pretty much absorbed before I go to bed. The little white beads inside the gel formula 'melts' as you massage the formula onto your skin. I like to do soft facial massages as I apply my sleeping packs anyways, so it works. However, make sure you actually softly massage your skin as you apply the product, otherwise the white beads won't 'melt' so easily. Aside from the formula's non-sticky feeling, I can also tell that it really moisturizes my skin and it leaves my skin feeling supple in the morning, which is a huge plus! Since I have combination to oily skin, I tend to lean toward lightweight products. I also like products that don't congest my pores and brightens my skin, with its rich green tea and niacinamide ingredients, this sleeping pack definitely fits the description. What it looks like after the Sleeping Pack has been massaged. Scents are a big deal for me as well. I mean, if I am going to put something on my face, it has to smell good to me. This sleeping pack has a scent that might be strong for some. I would say it's more than mild for me, however, I did not mind because the scent was pleasant and it became very mild after I applied it. Scents can be different to different people, so while I share how it smells to me below, it might not smell like that to you. Anyways, to me, sleeping pack smells like green tea with floral and herbal hints. It's sweet and relaxing to me, which is great and perfect for right before sleep time. What prompted me to purchase these capsule recipe packs was that they look adorable, are affordable, make great gifts, are more sanitary, travel friendly, and has a good variety targeting different skin issues. You have to admit, the mini k-cup like looks, make the products very cute and can easily make great gifts. If you don't know which kind a friend might like, you can easily gift them 1 of each to try without breaking your bank. Unlike normal sleeping packs in tubs, these are in small containers, so you can minimize possible contamination. These are also great for traveling and will always be fresh. 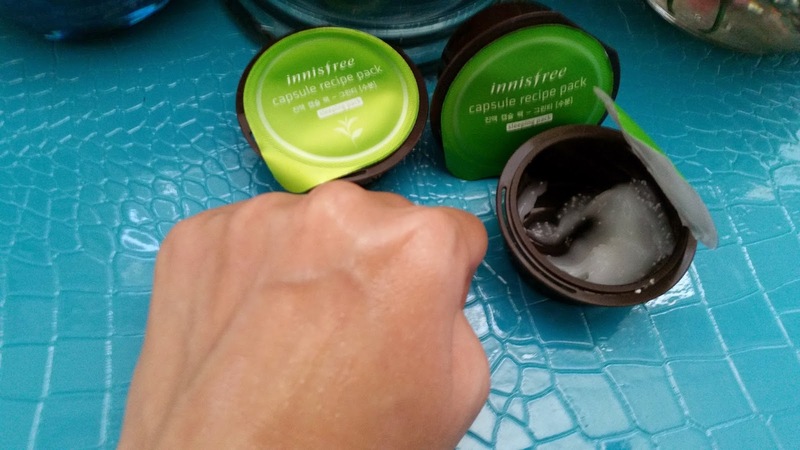 While Innisfree says these packaging are resealable, they are really not. As you can see in the picture above, you can slide the cover film through the slit and according to Innisfree, it will keep the product sealed. However, it just doesn't work, no matter how I try it. This is a huge con because each pack can be used at least 4 times and you wouldn't want the product to dry out before you finish using it. Luckily, I found a couple of alternative ways to keep the product sealed and fresh. Here are some ways to help seal the Capsule Recipe Packs. First, is to use the lid of another product. Here, I ended up using my lid from the Lassie'el Yogurt Massage Mask. 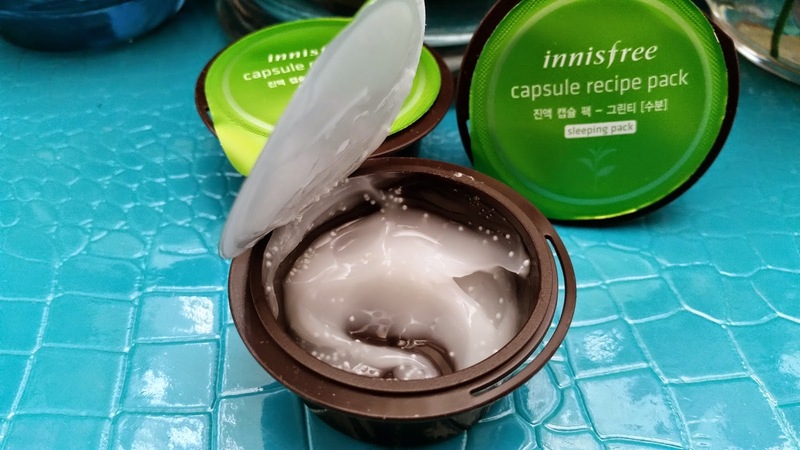 As you can see in the picture below, the Innisfree Capsule Recipe Pack fits perfectly inside the lid. 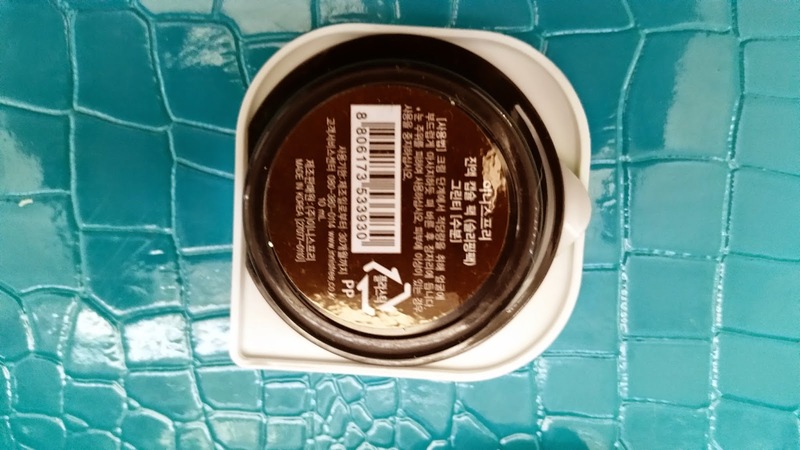 If you don't have another lid, you can use a light, single eye shadow case larger than the Capsule Recipe Pack or something else a little heavy to keep the lid in place. Before I purchased my Lasse'el packs, I used my Dolly Wink eye shadow quad to cover these Capsule Recipe Packs. Alternatively, you can scoop out the products and store them in another container that has a lid. Final Thoughts: Aside from the un-resealable packaging issue that I have found solutions for, every thing else about this Green Tea Capsule Recipe Sleeping Pack is perfect for me. I love its lightweight formula that just absorbs easily into my skin without clogging my pores. I love the sweet and relaxing scent that's a perfect treat right before bed time. I love the adorable packaging and how travel friendly it is. And I love the wonderful ingredients this Capsule Recipe Pack contains and the wonders they do for my skin. It's love all around and I am so happy I rediscovered Innisfree last year and took another chance at some of their products. Now that I've rekindled with Innisfree, the flame is stronger than ever. I have been trying a lot of their products, from skin care to makeup and will be reviewing them soon! I used one of these, too, and I like the idea of those cute little capsules and I liked the mask, too.